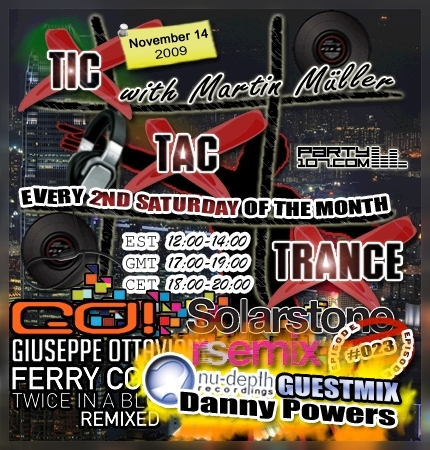 The first hour of my radioshow Tic Tac Trance #023 on November 14 will feature selected tunes from my favorite albums & compilations of this year: Giuseppe Ottaviani – GO!, Solarstone – rsemix & Ferry Corsten – Twice In A Blue Moon: Remixed. But of course this one hour set will be finalized with additional tunes from labels like Anjunabeats, Red Force Recordings + many more! It’s a pleasure for me to announce a new guestmix for the second half of the show. Label Manager, Producer and DJ Danny Powers, from nu-depth Recordings, will spin his latest favorite tunes. Expect some bangin’ tunes from his own label, but also records from other labels! My show will start on November 14 at 18 CET / 17 GMT / 12 EST. Check out your local time HERE!